Born in 1963 in a Kafkaesque communal apartment where eighteen families shared one kitchen, Anya grew up singing odes to Lenin, black-marketeering Juicy Fruit gum at her school, and, like most Soviet citizens, longing for a taste of the mythical West. It was a life by turns absurd, drab, naively joyous, melancholy-and, finally, intolerable to her anti-Soviet mother. When she was ten, the two of them fled the political repression of Brezhnev-era Russia, arriving in Philadelphia with no winter coats and no right of return. These days Anya lives in two parallel food universes: one in which she writes about four-star restaurants, the other in which a simple banana-a once a year treat back in the USSR-still holds an almost talismanic sway over her psyche. To make sense of that past, she and her mother decided to eat and cook their way through seven decades of the Soviet experience. Through the meals she and her mother re-create, Anya tells the story of three generations-her grandparents', her mother's, and her own. Her family's stories are embedded in a larger historical epic: of Lenin's bloody grain requisitioning, World War II hunger and survival, Stalin's table manners, Khrushchev's kitchen debates, Gorbachev's anti-alcohol policies, and the ultimate collapse of the USSR. And all of it is bound together by Anya's sardonic wit, passionate nostalgia, and piercing observations. I am absolutely fascinated with Russian culture and geography. While most people, when it comes to learning about history, seem to be fascinated with all things World War II, my preferred historical era of study is the Cold War. So pretty much anything with the word Soviet in the title perks up my ears. It was interesting to read about Von Bremzen's childhood in Moscow because, at the time, she didn't understand her mother's anti-Soviet sentiments and really had Romantic notions of the socialist lifestyle, even ruthless leaders such as Joseph Stalin. Von Bremzen presents the reader with an interesting dichotomy of emotions because the longing she is talking about in the subtitle is a longing for the old Soviet way of life. The nostalgia is somehow both understandable and confusing at the same time. But it is one that I, as an American, was never fully able to wrap my brain around during my time with this book. I enjoyed the parts of the book where Von Bremzen talks about her life, but I found the history parts to be a bit dry and difficult to trudge through, and I'm normally one that enjoys learning about Soviet history. Plus, I didn't entirely buy the whole food premise of the book. 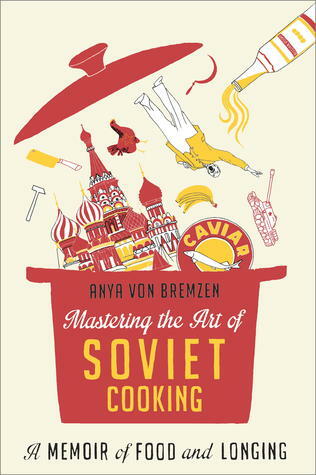 It seemed forced into the narrative - probably because she doesn't really talk much in this book about how food writing became her career - and also, I just really wanted to know about her life, not necessarily the history of Soviet cuisine. For that reason, what felt most natural and fascinating for me was when the author talks about her life in the Soviet Union and how she emigrated to America. Still, I would definitely consider this a worthwhile read, but it was one that took me many weeks to finish. This is by no means a book most people can breeze through in one sitting. I have just put this book on hold at the library. I too am fascinated with Russian history and was lucky enough to visit that country in 2011. My grandfather escaped Russia during the revolution, so I too am fascinated with Russia. I have this in audio -- hope my experience with it is better than yours. This is the third review I have read of this book, and yours is very interesting. I'm sorry that it didn't capture you in the way you wanted. Interesting concept. Too bad it sounds like it didn't fully live up to the premise. I'm glad you got something from it there -- sounds like an interesting bit of biography. This sounds so exotic to me that I am going to give it a try. I agree with you that this isn't a 'one sitting' read. I've been working my way through it for almost 2 months at this point (with long stops in between chapters!). That said, I do like the mixing of food history and anecdotes from Anya's life - I think her facility with description really helps in that case. But, I haven't finished the book either. So. I like memoirs and food memoirs in particular so this sounds interesting to me.